This newly built, spacious 6-bedroom property for rent sits surrounded by beautiful olive and cypress trees on the north-east coast of the island of Corfu, close to the small fishing village of Agios Stefanos. 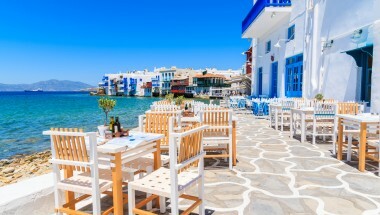 There are several bars and tavernas in the village, also a couple of supermarkets and boat hire. The white pebbled beach with clear water is ideal for swimming. From the villa and its terraces, there are amazing views over the Ionian Sea. The villa has been designed with a combination of modern and traditional architecture, and is very comfortably furnished throughout. The rooms are spacious and fitted with all modern amenities including satellite TV (with BBC, CNN, MTV, Bloomberg, Sports &amp; Movie channels), Plasma HD with Home Cinema, DVD/MP3 Player, printer/fax and wi-fi internet access. The bedrooms all have air conditioning and bathrooms have Jacuzzi baths. There is also a gym area. At the front of this property for rent is an inviting swimming pool, and an outdoor dining area with barbecue, where meals can be taken, while enjoying the views over Agios Stefanos bay. 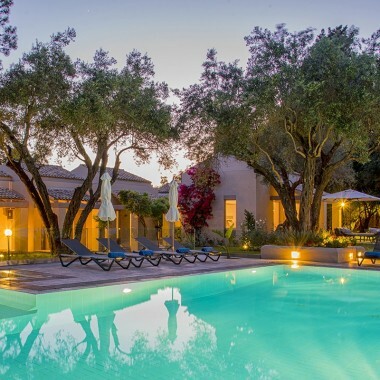 This beautiful villa has some nice extras for guests, including a selection of finest Greek wines in a wine fridge, bathrobes, slippers, toiletries, a complimentary fruit basket and a welcome food hamper (with home made organic jams, local olive oil and organic vegetables and eggs). There is a cook to prepare breakfast and one other meal each day, six days a week. Lower Ground Floor: 1 double bedroom with en suite bathroom. Laundry room. Ground Floor Large comfortable living/dining room with fireplace. Well equipped kitchen, including fridge / freezer, cooker, microwave, dishwasher, washing machine, espresso coffee machine, kettle and toaster. 1 double bedroom with Jacuzzi and en suite bathroom. 1 twin bedroom with en suite bathroom. First Floor Master bedroom with Jacuzzi and en suite bathroom. 2 twin bedrooms with en suite bathrooms. A beautiful property in the north-east of Corfu, surrounded by olive and cypress trees, close to the small fishing village of Agios Stefanos. 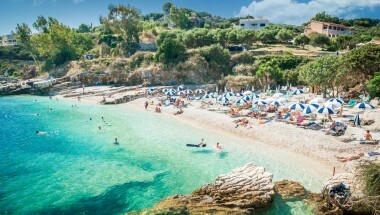 There are several bars and tavernas in the village, and white pebbled beach with clear water is ideal for swimming. From the villa and its terraces and swimming pool, there are amazing views over the Ionian Sea.